[AUTO]:When it is retired from (RC), COST [Counter Blast (1)], and return up to two gauges equipped to this unit to your hand. Okay, this card is misprinted, this skill should be AUTO, not CONT. The timing for when to prc skills would be different with Megarex and Deathrex if it were CONT, not that people actually care. Anyway, you could +2 directly if combined with Megarex or Deathrex, but realistically, you’re only looking to obtain 1 equip gauge from it. Unless Sonic Noa is boosting it and you managed to ride Gigarex, otherwise if this racked up only one EG and you’re looking to +2 next turn, the opponent’s just going to attack it. 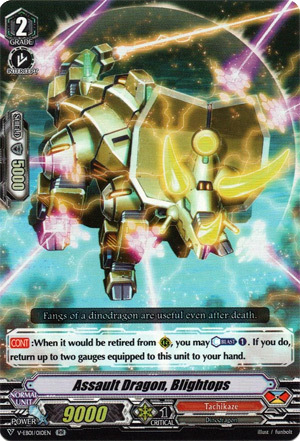 Happily this may still work in your favour since unlike Skyptero, ANY retirement will do, so if the oipponent does kill it in battle, you still avoided an attack on the vanguard and got to replace Blightops. Why are you not running this at 4? Sure it doesn’t scale to Force RGs but that’s hardly an excuse.